Approved by the FDA in 1993, Risperdal (risperidone) is an atypical antipsychotic medication used to treat schizophrenia and symptoms of bipolar disorder, as well as symptoms of irritability in autistic children. By the year 1996, Risperdal prescriptions had topped one million, but in the years since then, it has been associated with some serious side effects, particularly when used to treat other conditions besides those approved by the FDA in off-label prescriptions. By 2012, more than 420 Risperdal lawsuits had been filed in state and federal courts throughout the country, with plaintiffs claiming that manufacturer Ortho-McNeil-Janssen, a subsidiary of Johnson & Johnson, failed to include adequate warnings on the product labels about the health risks. At this time, doctors and scientists aren’t exactly sure how Risperdal works, though they assume it affects two neurotransmitters in the brain—serotonin and dopamine. It is believed to interfere with the communication between these neurotransmitters, which in a patient with schizophrenia, for example, may help calm abnormal communication in the brain that causes negative symptoms like hallucinations and delusions. Though approved to treat schizophrenia, bipolar mania, and irritability in autistic children, some doctors have also prescribed the drug for the treatment of obsessive-compulsive disorders, stuttering, Tourette syndrome, and severe dementia. Minor Risperdal side effects include sensitivity to temperature, impaired thinking, dizziness, hyperactivity, sudden involuntary muscle movements, abdominal pain, fatigue, fever, and nausea. Tardive dyskinesia: An incurable movement disorder, Tardive dyskinesia causes spasmodic movements, grimacing, lip smacking, and other uncontrollable muscle movements. This disorder has been linked with some antipsychotic drugs, and at least three cases of the disorder have been reported with the use of Risperdal. So far, scientists are still researching any potential connection between this drug and the disorder. Diabetes: Some studies on Risperdal have suggested the drug causes an increased risk of high blood sugar – an early indicator of type 2 diabetes. A study of U.S. military veterans with schizophrenia reported that patients taking risperidone had 1.49 times as many cases of diabetes compared to patients taking other types of antipsychotic drugs. There is no clear link yet between the Risperdal and diabetes, but patients are advised to have their blood sugar levels tested before and during treatment. Neuroleptic malignant syndrome (NMS): A potentially life-threatening neurological disorder connected with the use of antipsychotic drugs, NMS causes muscle rigidity, fever, autonomic instability, delirium, paranoia, changes in blood pressure, and excessive sweating. At least fourteen cases of NMS have been reported with risperidone use. Sexual dysfunction: In some patients, risperidone has been reported to cause sexual dysfunction, including decreased libido and impaired performance. Gynecomastia: A condition in which a man’s breasts become enlarged, gynecomastia has been associated with the use of Risperdal. In 2006, a study by Duke University researchers found that patients taking Risperdal were more at risk for male breast growth than those taking other similar medications. Cardiovascular problems: High blood pressure, heart attack, and palpitations have been reported with the use of this drug. Stroke: Some strokes as well as stroke fatalities have been traced to risperidone, especially in elderly patients with dementia-related psychosis. Data from four placebo-controlled trials found that there was a higher incidence of stroke in elderly patients treated with risperidone compared to those treated with placebo. Death: Especially among elderly patients who are given risperidone, these fatalities are most likely due to heart failure. April 2005: The agency required a black box warning on all risperidone product labels, warning patients and physicians that use of the drug in elderly patients with dementia was associated with an increased risk of mortality. They based the warning on the results of a clinical trial strongly suggesting that atypical antipsychotics increased the risk of death in dementia patients. October 2006: The FDA approves Risperdal for the treatment of irritability associated with autism in children and adolescents. August 2007: The FDA approved the use of risperidone for children ages 13-17 with schizophrenia, and for children ages 10-17 with bipolar disorder. November 2008: At an FDA meeting, doctors raise concerns about Risperdal side effects in children, including breast growth in male patients. Still, the FDA chooses not to strengthen warnings on the drug. 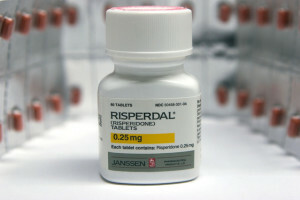 As early as 2008, plaintiffs represented by qualified Risperdal lawyers started filing lawsuits against Ortho-McNeil-Janssen and Johnson & Johnson, stating that the manufacturers had failed to provide proper warnings about the risk associated with the drugs. 2008 Risperdal gynecomastia lawsuit: The lawyer representing six teenage boys who allegedly suffered gynecomastia after taking Risperdal told the Wall Street Journal that the drug can stimulate the production of “prolactin,” a hormone involved in lactation. Two of the boys involved in these cases allegedly required mastectomies to repair the complications. August 2012 fraud settlement: Johnson & Johnson agreed to a $181 million consumer fraud settlement with 36 states and the District of Columbia. State and federal authorities accused the company of promoting the drug for off-label uses it was not approved for, including dementia in elderly patients, bipolar disorder in children and adolescents, depression, and anxiety. The company was also said to have minimized or concealed risks associated with the drug. Johnson & Johnson denied any wrongdoing. September 2012 gynecomastia settlement: Johnson & Johnson agreed to a pre-trial settlement in a Pennsylvania Risperdal lawsuit, in which the plaintiff alleged he suffered psychological trauma after growing breasts while taking Risperdal between 1999 and 2004—starting when he was nine years old. He had to have the breasts surgically removed. The drug was not yet approved for the use in children at the time the plaintiff took it. October 2012 Risperdal lawsuit settlements: The manufacturer agreed to five more settlements concerning gynecomastia in Philadelphia. In a report submitted for trial, former FDA Commissioner David Kessler, a pediatrician, stated Johnson & Johnson promoted the drug for non-approved uses in violation of the Federal Food, Drug, and Cosmetic Act. November 2013: Johnson & Johnson agrees to pay one of the largest healthcare fraud settlements in U.S. history—approximately $2.2 billion in fines and penalties over misbranding Risperdal, Invega and Natrecor for uses that were not FDA-approved. A Justice Department representative states that J&J “recklessly put at risk the health of some of the most vulnerable members of our society — including young children, the elderly, and the disabled.” In addition to off-label promotion of Risperdal to elderly dementia patients in nursing homes, J&J was also charged with providing illegal kickbacks to doctors and medical facilities.